The Associated Builders and Contractors Western Michigan Chapter awarded Pioneer Construction the Excellence in Construction award for the renovation of Sharpe Jaguar and Land Rover. The Excellence in Construction awards highlight individuals and companies for providing excellent work in our communities. By Barton Group|2019-02-13T16:56:23-04:00|Categories: In Recent News|Comments Off on Congratulations Pioneer Construction! The Barton Group is pleased to announce the completion of LED lighting specialist, TecNiq Inc's 100,000-square-foot facility in Kalamazoo. The new facility supports exponential growth TecNiq has experienced over the last three years and will create 120 new jobs and a $6,596,000 investment in Comstock Township. The historical Village of Lawrence welcomes The Shack. A restaurant with a fun and friendly atmosphere serving fresh pattied hamburgers, fries, and 15 different hotdogs! 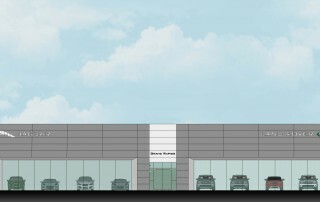 The new Jaguar Land Rover combined dealership is underway. According to The Sharpe Collection General Manager, George Sharpe Jr. “The new design emphatically puts the client first in every key interaction: research, purchase, delivery and service." Congratulations Jill Cooper on the opening of The Fire Brick Cafe at your new location, 105 N. Paw Paw Street in Lawrence.